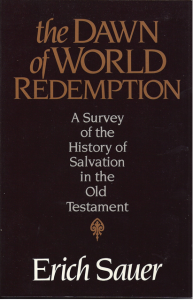 This first book (1951) concentrates on the beginning of creation and Old Testament history leading up to the first coming of Christ. This reveals his belief in a form of gap theory which runs throughout his books but does not affect his general orthodoxy. His dispensational plan includes seven dispensations but his actual lists may not include each one in every list. He sees a test and a judgment in each dispensation and clearly marks distinctions among them, especially Law and Grace, Grace and Kingdom. He also gives specifics about Daniel’s 70 weeks that are roughly the same as newer chronologies. Sauer is very good on the literal nature of the millennial kingdom. A criticism often directed at Sauer, being a German theologian during WWII, is that he gives detailed history of Noah’s three sons, emphasizing Shem as the bearer of the seed of Messiah and Japheth as the father of Indo-Germanic, i.e. the “Aryan” race. Here Sauer sees, “according to the testimony of Old Testament prophecy, great extension of political and intellectual influence is the privilege of the Japhetic peoples.” This was still sensitive language in the early 1050s, but I don’t read any racism in Sauer at all, just a simple statement of western history. The follow up book is The Triumph of the Crucified.